Seiren, one of the earlier levels, is pretty tough! 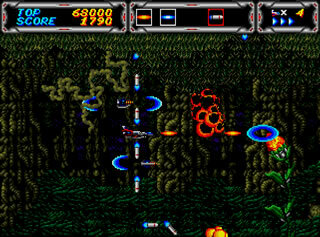 Thunder Force were a set of proper games for the Megadrive. In the early 90’s, the Sega Megadrive (Genesis if you’re American) was seen as a more grown up computer than the Super Nintendo, and with 3 good reasons. #1 the Megadrive pre-dated the Super Nintendo by about a year or so in the UK, so it had a time to show itself as a graphically superior machine. #2 The graphics, as well as the animation, was marketed to the teenager/young adult audience with “cooler” characters, and finally #3 the games were on the whole harder. The Thunder Force Series were a series of games for the Sega Megadrive, the story goes like this – the Galaxy Federation (the good guys) have been fighting the ORN Empire (the bad guys) for around 100 years (which took place in Thunder Force 1 and 2), this time, the ORN Empire have fought back with a cloaking system, which has hidden their main base from the Federation. Furthermore, to defend the base, they have build some badass defence systems which you have to defeat. So that’s the basic story, what about the game? Well, in a departure from the first two Thunder Forces, this game is a side scrolling shoot-em-up, however at times the way in which the game scrolls changes. You have two weapons, one that is powerful that shoots forwards, the other shoots backwards and forwards. More weapons can be obtained throughout the game but you can lose them when you lose a life. If you’ve played R-Type it is a very similar excursion with this game, just shoot everything that moves. Yes, this is your standard sideways scrolling shoot-em-up which has long since died as a viable genre of games, shame really as they are a lot of fun, this one in particular. However, the way in which this game differs from most is the difficulty level. You get 5 levels to start off with, each one is extremely tough. For example, whilst most level bosses have a traditional “weak spot” which you are able to penetrate, some of the regular enemies also need similar accurate targetting. 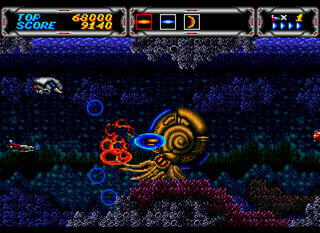 Furthermore, each of the levels have added hazards – with Hydra, the underwater level – having a constant upstream you have to battle. However, with this game you don’t feel cheated. It’s hard enough to be enjoyable, but thanks to the solid fast controls, and the fact you know exactly what each button does, you don’t feel cheated or screwed when you die. You die because it’s your fault. And you will die a lot. However, what’s brilliant is you know exactly how you die, and you not feel frustrated, so it works pretty well. Finally, add to the brilliance of the game with the fact that it looks stunning with bright, rich colours, the fact it moves at a fair pace, and a soundtrack that’s pretty kicking, and you have a great, classic shoot-em-up, ideal for the Megadrive Generation.